Confused? Build will include pilot? What about those wonderful belts? Terrific work on the front office. Thanks Peter! I've definitely been able to doesn't sound good at the bench today so I'll post an update shortly. Hi Shaka, the pilot is for another build. I had this one together so I thought I would check the fit of the pilot before I tackle that build. I have a Tamiya Mk VIII I want to build in-flight. Since I plan to do it as Grey Nurse,a pilot figure in tropical flight gear is more appropriate which the Masterdetails one is. So I'm just thinking ahead. Sorry to confuse you. 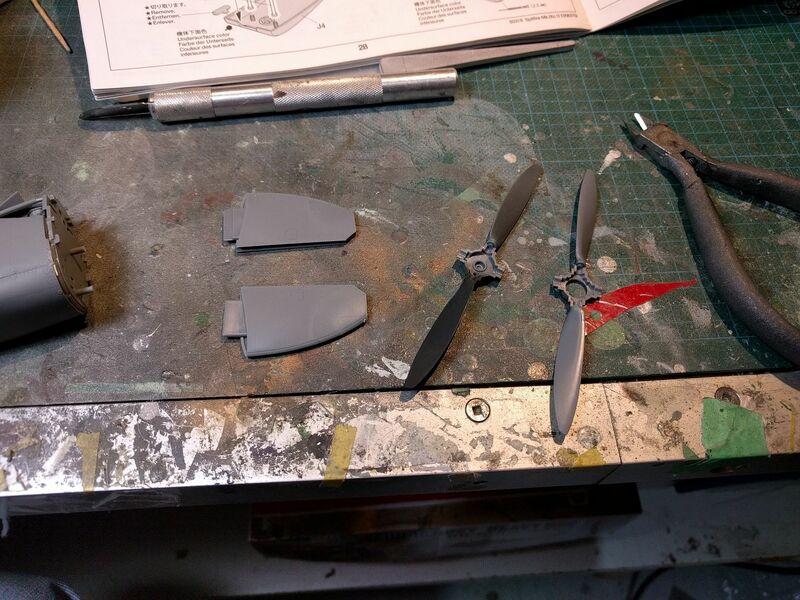 So, while waiting for the fuselage and wings to dry, I put together the tailplanes,rudder and prop. 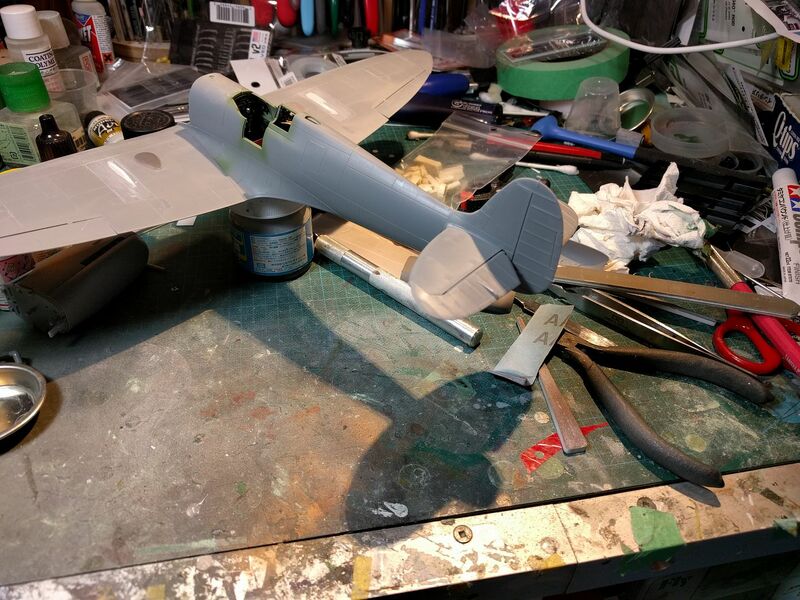 I then attached the rudder and tailplanes to the fuselage. Again, I just glued them directly on and eliminated the PE hinges and rods. For the first time,I ended up with some fit issues regarding the engine cowls. I'm not sure what happened so I decided the best approach was to start with the lower cowl. This has the most positive mount to the fuselage so I glued that on first. Once this set, I added the engine. Some fiddling was required and in the end,I wasn't able to completely eliminate all the various gaps. I think a couple parts were slightly warped too. The above gap closed up after some careful glue applications. The fit is the worst along the leading edge of the wing root. I'll see if I can tighten it up a bit more. Otherwise, the main assembly is now complete. I don't recall seeing that brand of setabelts before Carl but they look most excellent. The whole cockpit assembly looks stellar. Good job. Any thoughts? Should I trim the chute pack and/or seat down a bit and get him to sit lower? Or will he fit OK? It does n't look like the Masterdetails figure will fit to me. 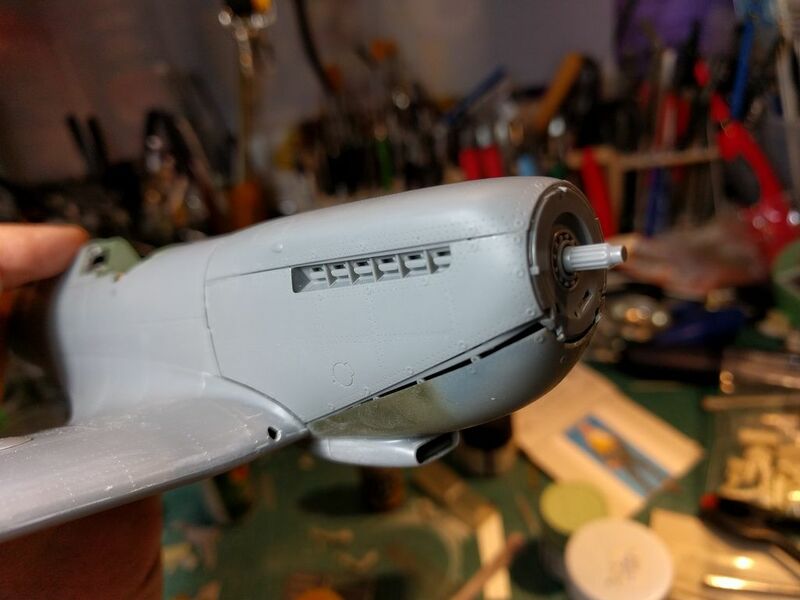 Interesting issues with the cowlings. I wonder why they had gaps? Something I shall watch out for on my build. Thanks for the heads-up. 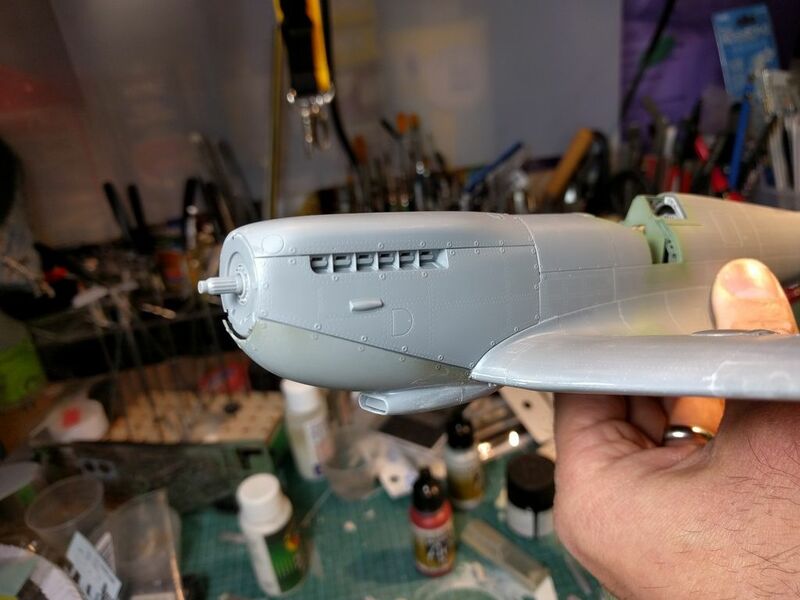 Very nice work Carl........extremely quick build as well. Thanks Guy! I picked up the seatbelts from HLJ but my LHS now carries them too. They're Japanese and are laser cut. I've started trimming the chute pack and the seat both so hopefully I'll get a suitable fit. 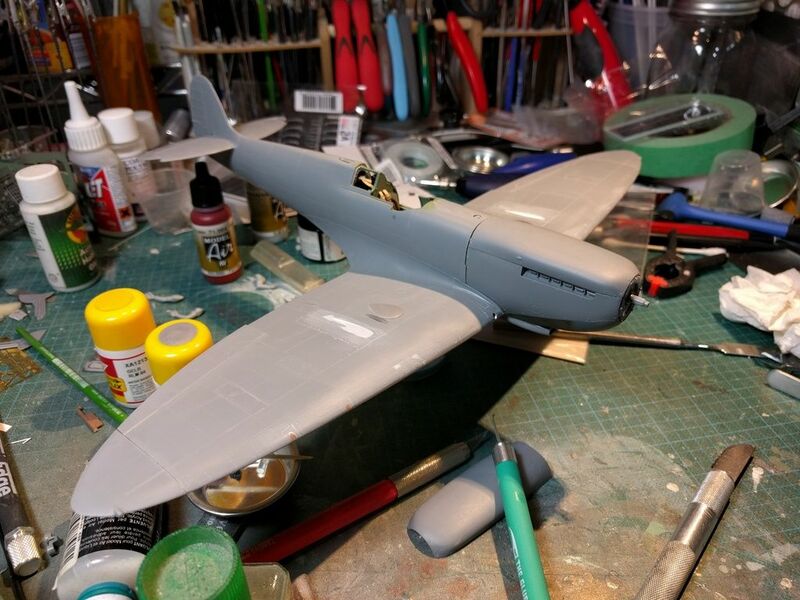 As for the cowlings, this is my fifth Tamiya Spitfire and the first with any issues there so I suspect that something must have ended up misaligned. So I'm certain it was very much the exception to the rule. Thanks Andy! It is going fast, especially for me. 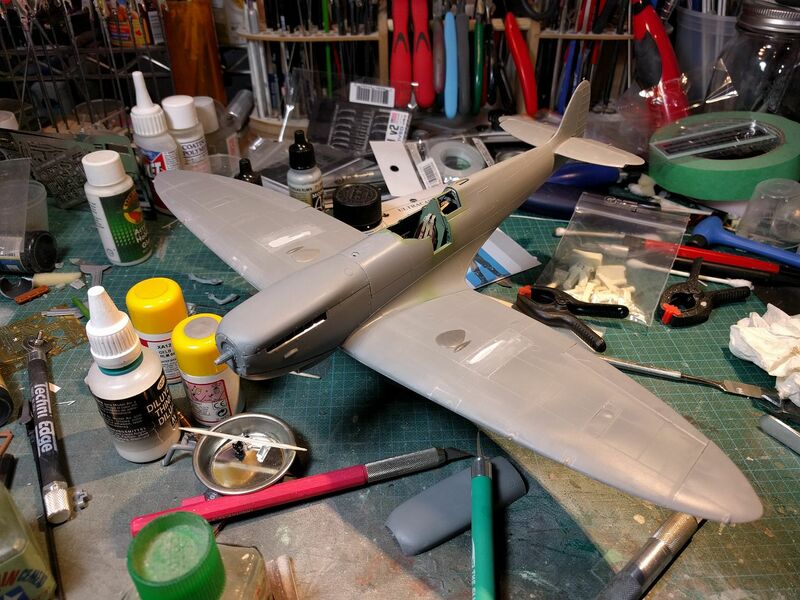 I'm kind of lost for words about those fit issues Carl, it just doesn't make sense for a Tamiya Spit not to come together like pieces of a jigsaw puzzle......so puzzled I am!!! Nah, mine's weren't perfect either, but it may be slightly better than what you are experiencing now. 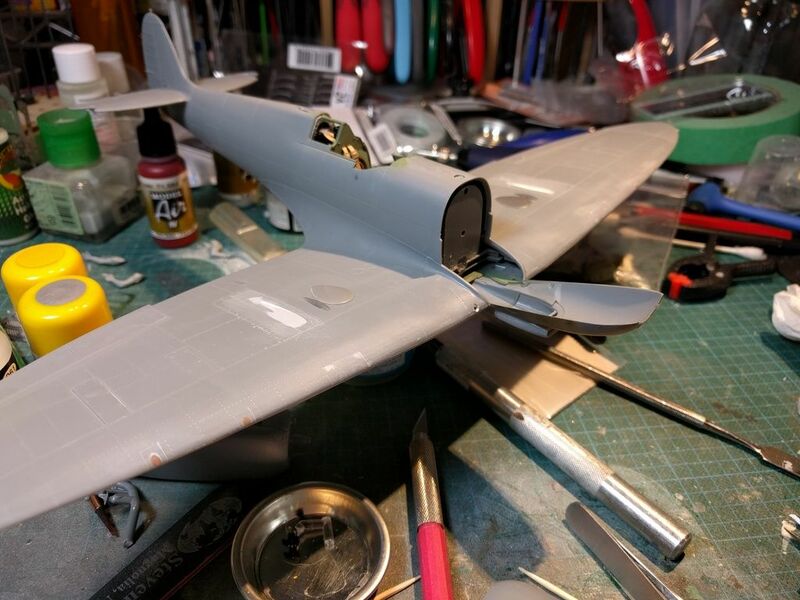 A Tamiya Spitfire with fit issues, wow, so the nice people from Tamiya are mortal after all, it can happen, I'm building two Hobbyboss Spitfires, the first went together great, the second not as well and they are the same kit. Good job us modellers can cope with these things. It certainly threw me for a curve as well. I'm so used to their kits just going together that I've often find my own way in terms of build order knowing it would all go together. I guess it goes to show you about being a little too comfortable. I've had two go together perfectly, two where there was a bit of fiddling and one where it didn't matter since I was swaping in a completely new nose section. Of the two fiddly ones, this needed the most tweaking. It's still not bad and much less than I needed on my PCM kit so I can't really complain. Yah, definitely! The Tamiya kit was a pleasurable experience compared to the Revell. The fit isn't bad, but it required sanding and cleaning which the the Tamiya required very little, if any. I ordered a Mk VIII and will be building it slowly and deliberately. 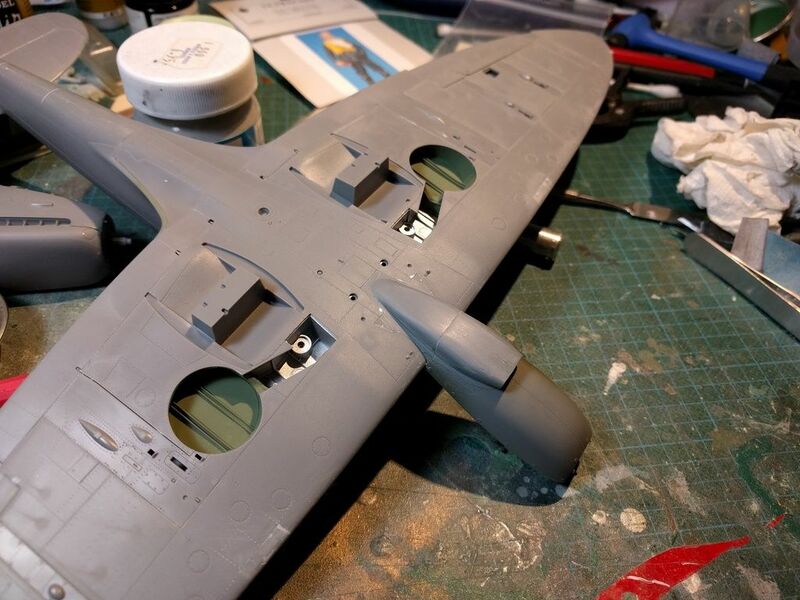 I'll treat it like how all the excellent modelers on this forum do -- every part is treated like a project of it's own. I'm starting feel like I'm on an assembly line..lately.